All eyes are on Greece, where left-wing Alexis Tsipras became the new prime minister on Monday, Jan. 26. An open secularist, he took the oath of office without wearing a tie, and declined the blessing of the Greek Orthodox Church. Tsipras is the leader of Syriza, or Coalition of the Radical Left, a loose alliance of left-wing groups, including some who formerly split from the Greek Communist Party (KKE). A triumphant Alexis Tsipras told Greeks that Syriza’s win in Sunday’s early general election meant an end to austerity and humiliation, and that the country’s regular and often fraught debt inspections were a thing of the past. “Today the Greek people have made history. 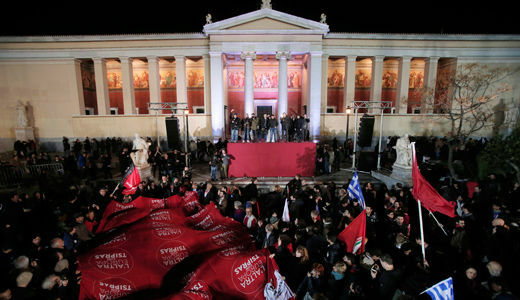 Hope has made history,” Tsipras said in his victory speech at a conference hall in central Athens. A new epoch in Greek, and European, history has broken forth. As expected, Syriza won Sunday’s elections in Greece with 149 of the 300 seats in the parliament. But that left Syriza two seats short of a majority, which obliged them to find a coalition partner. Only two parties were potential partners, the centrist To Potami (the River) and the rightist anti-austerity ANEL (Independent Greeks). The KKE had said that it would not enter a coalition government with Syriza. Some have suggested that Syriza could have formed a minority government and then forged temporary alliances on the floor of parliament, issue by issue, but the Syriza leadership did not want that and chose the ANEL alliance route. What commitments Syriza made to ANEL to get it into the new government remain to be seen. The head of a new super-ministry in charge of negotiating with the Troika, Deputy Prime Minister Yanis Dragasakis, is a former member of the Central Committee of the KKE. The new minister of interior, in charge of police, Nikos Voutsis, was prominently involved in anti-austerity demonstrations in the past. His appointment is important because under the old regime the police were accused not only of brutality but of links to the neo-Nazi Golden Dawn Party. The new foreign minister, Nikolaos Kotzias, is also a vocal opponent of the austerity measures. Minister of Productive Reconstruction Panagiotis Lafazanis is another former KKE member. Aside from the defense portfolio which went to ANEL leader, Panos Kammenos, ANEL got only minor cabinet posts. Initial policy announcements by Tsipras are strikingly radical. On domestic policy, he immediately stopped further privatizations, including of port facilities, and doubled the minimum wage. He announced free electrical service for 300,000 of the country’s poorest families. There will be food aid and efforts to create jobs in a country where a quarter of the workforce is unemployed. Unpopular property taxes will be cut, but will be more than made up for by a crackdown on Greece’s notorious practice of tax evasion by the rich, and higher taxes on the wealthy. In the past Syriza has promised to tax the country’s wealthy shipping industry, which currently pays no income tax. The new government plans to go to the Troika, not hat in hand, but with new demands, including the repayment by Germany of a “loan” that Greece was forced to hand over to the Nazis when they occupied the country during World War II. Greece will ask for new conditions for the repayment of its current bailout loans, amounting to a renegotiation and a moratorium on current payments. On foreign policy, Tsipras repudiated a European Union statement blaming Russia for the recent bombing of a streetcar in Mariupol, Ukraine, which happened in the context of the ongoing fighting between the right-wing Ukrainian government in Kiev and dissident forces in Eastern Ukraine. In the past, Tsipras has denounced the Kiev regime as including “neo-Nazis.” However, for now there is no talk of pulling Greece out of NATO, nor out of the European Union and the euro. Some European communist parties and others were elated by the Syriza victory. 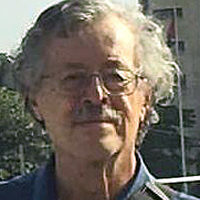 Pierre Laurent, national secretary of the French Communist Party, said, “With the victory of Syriza, the Greek people move to restore their dignity and write a new page in history … In France, it is possible also.” A similarly congratulatory message came from the United Left (Izquierda Unida) in Spain, an alliance which includes the Communist Party. But others were more cautious and critical, expressing worry about the appointment of Kammenos as defense minister, the lack of women in Tsipras’ cabinet, and the NATO question. Among the Greek and European ruling classes, reactions to the election mix panic and rage. German Finance Minister Wolfgang Schäuble declared that the Troika and Germany would not budge from their harsh position toward Greece: that the Greeks have only themselves to blame for their current sufferings caused by irresponsible and dishonest management of their economy by past governments. The fact that Syriza has raised the issue of Nazi German despoiling of Greece during World War II, for which Greece was never compensated, did not improve the mood in Berlin. Other ruling-class figures threaten to push Greece out of the European Union. If Tsipras sticks to his guns, there will be a mobilization of right-wing forces in Europe and beyond. The European ruling class does not just fear what might happen in Greece, it fears the example Greece might give to other poor nations such as Spain, Portugal, Italy and Ireland, which might throw over the Troika regime of austerity and privatization and demand that the crisis of capitalism not be balanced on the backs of workers and the poor.